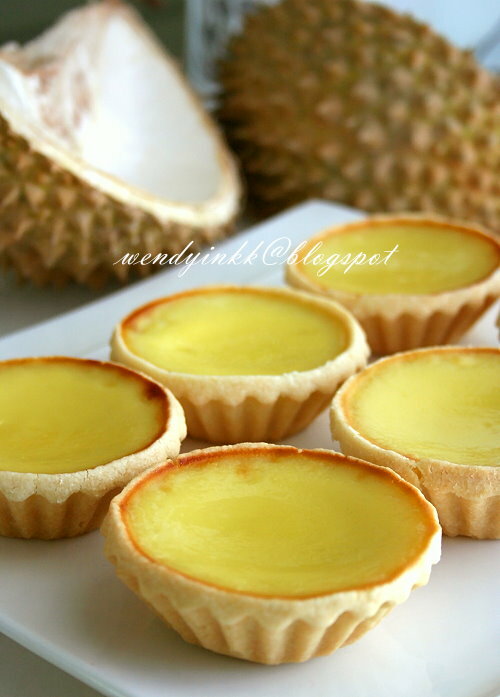 I had my first durian egg tart or durian custard tart bought from Karak in 1999.. long ago. It was a treat from my housemate from Kuantan. She always passes by Karak whenever she drives back to KL. She told me, whenever she passes by and if they are available, she must buy. Back in those days, the amount they make is not as much. Durian bakes are extremely popular in Karak. I used to buy it from Yik Kee, I'm not sure if there are other shops doing it as well. It's situated on the main road. I do hear they have branches in Klang Valley and in Genting Highlands too. Now even with so much pulp, the egg tarts are not as strongly durian as those sold. My durians are nice to eat, although not graded. I wonder if the commercial egg tarts has durian essence added in since the smell is soooo strong. 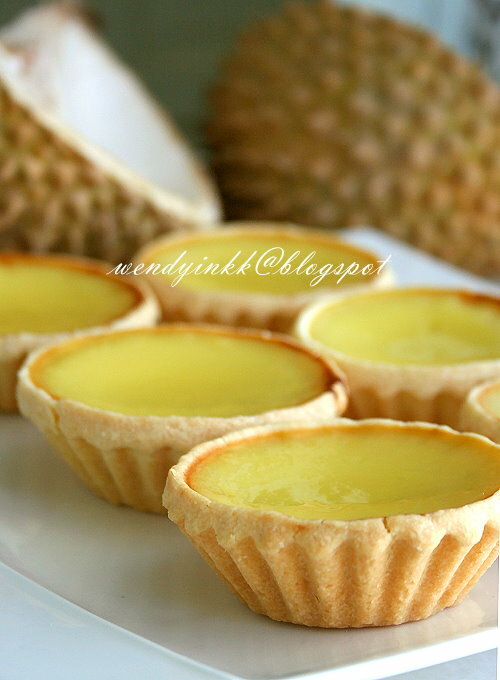 My custard's texture gets rougher with more durian as I have done the filling twice with different ratio of durian. But then again, I'll gladly trade the less intense fragrance than to use some durian essence. I think if I add some flour to prepare the filling, the outcome could be smoother, just like the filling for seri muka. But I have no time to experiment anymore. I made this yesterday and here it is today. Phew! 1. With a mixing spoon, mix butter with sugar and egg until it comes together and turns creamy. Try not to incorporate air by whisking. Add in the flour mix until a dough forms. 2. Bring the dough together to form a lump. Cover and let the dough rest for 30 minutes. 3. Roll out dough into 6-7mm thick. Cut with a 3.5 inch round cutter. Place dough disk into a fluted egg tart pan, and press the dough to form. 5. In a saucepan, put water and durian flesh and bring it to a boil on medium heat, stirring all the time. The flesh will melt away, leaving behind the fibres. Strain it. Leave to cool. 6. Mix eggs with salt and sugar (try not to incorporate air). Add in milk. 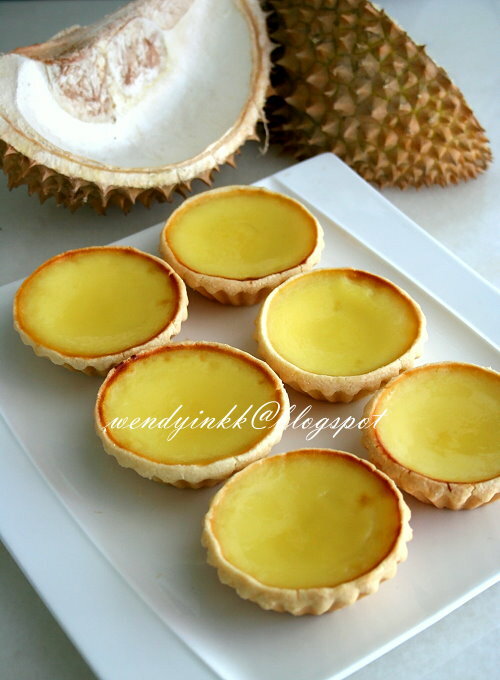 Combine with cooled strained durian paste. Strain the whole custard mixture. 7. Preheat oven to 170(fan)/190C. 8. Remove crusts from the fridge and place them on a baking tray. Pour the custard filling until it's almost to the rim. 10. Leave it to cool down to warm and remove from the tart pan. *I got 22 pcs of tarts and only 1 Tbsp of extra custard. How many pieces and how much filling is needed depends on your technique on shaping the crust. Disposable aluminium ones might give you around 26-30 pcs. Enough reserve for me ya..
Receta espectacular como siempre y muy bien hecha gourmet e irresistible,ahugs,hugs. good try...the crust look great!! I like this but my sons don't eat durians! I not yet eat durian tarts. 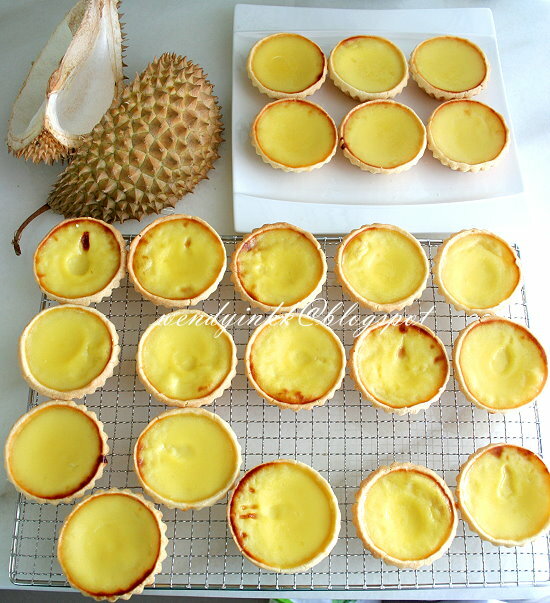 Hope I can get my tarts done beautifully as yours :) Do you think blend the durian flesh till fine then added into milk egg mixture is an good idea? Then drain the custard before used. This is a must try in this durian season ! Nice crust, nice custard. Thanks for the idea. No I won't do that. Cooking and straining will remove those fibres that interfere with mouthfeel. Plus you will introduce too much air in. The durian pulp is viscous and it may trap air bubbles. Make more for ur nephews! 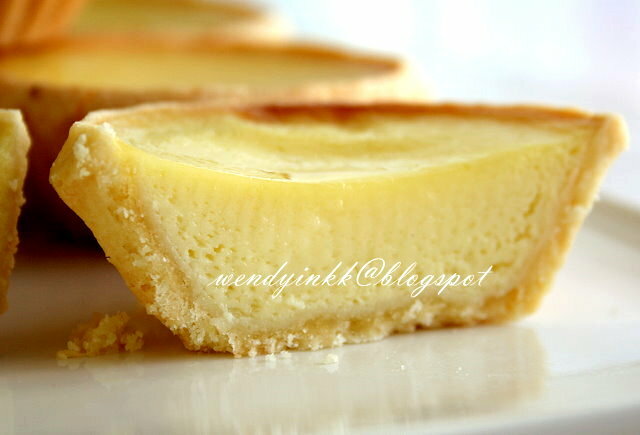 I have other recipes for regular egg tarts. Hi Wendy! The crust looks even and thin - hallmark of good egg tarts! so tempting! i think it's time for me to start action in my kitchen again! How do you prevent air from getting into the egg mixture? Just crack the eggs without beating them and mix tog with salt and sugar? Whisk it lightly until the eggs is homogenous. Try not to create to much bubbles during whisking.